There's a mantle that the Liberals have always claimed for themselves: Canada's natural governing party, and who wouldn't want to? They governed for 69 years during the 20th century and rightfully earned bragging rights. Recently there were some arguing that the Tories could claim that title for themselves if they governed (ruled) from the center -- but with one of the founding members of the former Alliance Party running the show that was surely a pipe-dream. Counter-intuitively I guess, I've always believed that like in Britain where that honour belongs to Labour, in Canada it probably could with the right leader, just as easily belong to the NDP. A crazy notion, eh? A party that has never won more than 43 seats in a Parliament with 308, as the country's natural governing party. 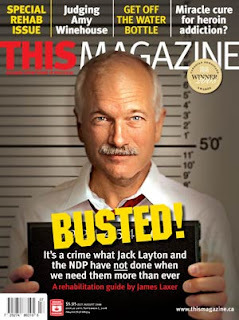 It's getting the right leadership that's all important to lead them out of the wilderness and it looks like Jack Layton is simply not that guy. He has never, as Naomi Klein suggested he must, proven he can be a counterweight to Stephen Haper's Conservatives. This while having the advantage of probably the two least popular men running the two major parties in recent history, he's been unable to crack the 20% popularity mark for his party in the polls. While he himself consistently polls as the most liked and trustworthy of the party leaders he has found it impossible to fashion that into any kind of advantage for his party. How can that be? Well, for starters to succeed you have to have someone who believes you can win in the first place, and someone willing to stand up for traditional NDP/CCF values in the second place. 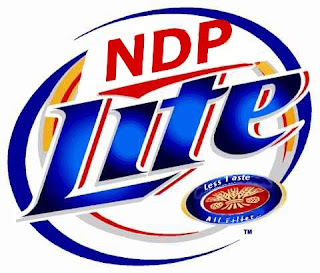 The NDP looks to be a party that has lost its raison d'être over the years. As James Laxer noted in his 2008 piece for 'this magazine' entitled 'How to Rehabilitate the NDP' (now located at this.org), ...in its battle to replace the Liberals as one of the country’s two major parties, the NDP has watered down its socialism almost to the vanishing point. Sadly for the current New Democratic Party, it's those vanishing principles that I believe are what give them the best shot at being Canada's natural governing party -- at least from the left that is. As Laxer further notes, we live in an unequal society that is seeing an increasing gap between the rich and poor and the current brand of blood-thirsty capitalism that marks this era is rapidly destroying the middle-class and creating an even greater degree of inequality. In this environment a toothless NDP is virtually useless to the Canadian electorate as a check on the pro-business/corporatism bias of the two major parties. So if you're a progressive why not vote for the Liberals over the NDP? They play to win, and by doing so they give weight to Iggy's claim that a vote for the NDP or the Greens is a vote to help keep Harper as PM. In my lifetime one of the things that has kept the federal Liberals on top has been their ability to lift the best portions of the NDP's party platform and make them their own, all the while claiming to be fiscally responsible (at least more so than those on the left that they were outflanking). This is not a criticism of the Liberal Party. A good idea is a good idea no matter who supports and implements it. i.e. Equal rights for gays and lesbians decriminalization of pot, investing in alternative energy, better housing policies for the poor, raising the minimum wage, cutting off trade with countries/companies that use sweatshops/slave labour, cutting military spending, increasing Peace Keeping operations, standing up for Canadian sovereignty and human rights, a national daycare program. I frankly don't care what the name of the party is that supports these and similarly progressive ideas -- it's the ideas. But if you want to see these ideas implemented fully you have to get elected and you have to convince Canadians you are ready to govern. The NDP has not sold enough Canadians on that idea and in fact they seem curently to be bleeding followers to Green Party who in the latest EKOS poll were at 13% to the NDP's 18.5%. As a young NDP voter all of this used to frustrate me no end. Fiscal conservatism belongs to no party and the Trudeau Liberals were anything but. Nor is that idea solely the purview of those on the right. It's merely the principle of remaining within a fixed budget which as citizens we are all forced to do, on the left or the right -- the issue in politics is what you choose to spend the monies you do have available to you on. I've always been pretty sure that an NDP government could manage the spending from the public purse at least as well as the other two parties but spending it on programs I supported and believed in (i.e. not tax cuts for already wealthy corporate citizens). They have failed to convince the majority of Canadians that they are capable of this. So in spite of the obvious advantage of being in agreement with the majority of Canadians on most important issues they can't convince them to vote for them. This makes any notion I ever had of their being a governing party let alone Canada's natural governing party is almost as ridiculous as a bunch of right-wing ideologues claiming that prize for themselves. Not likely to happen anytime soon. The problem is that Canada is right next door to the 800 pound gorilla (USA). So, 'Social Democrat' (aka NDP) is a dirty word. However, in Europe Social Democrats reign supreme. Canadian voters have become IGNORANT of what's important...just like dumb American voters who put George Bushfire in power and the recent Republican surge in the half term Congressional elections of 2010. Heck, I say: GIVE THE NDP A CHANCE! The Liberals & Conservatives had their chances -- and have fuc*ked up the country in different ways. Right?